After Randy learns of his cancer diagnosis, a doctor urges him to behave as if he’s going to live a long time. Randy replies that he’s way ahead of the doctor, in that he just bought a convertible and got a vasectomy. Randy says he’s not in denial about his situation, and that he’s living like he’s dying, but he’s also living like he’s still living. Being realistic but positive in your attitude and actions is the core of Randy’s beliefs about behavior. We all must confront our realities, but we can do so in a positive and hopeful light. Dr. Herbert Zeh, Randy’s surgeon in Pittsburgh, says he worries about patients who are too optimistic or ill-informed, but he is also upset when patients are told that they “have to be optimistic or their treatments won’t work,” because it pains him to see patients who are having a tough time believe that their lack of positivity causes their pain. Randy’s take is that optimism is a “mental state” that can enable you to do “tangible things” to improve your physical state. Dr. Zeh sees Randy as perfectly balancing optimism and realism, and Randy says that he loves how his vasectomy doubles as appropriate birth control “and an optimistic gesture” about his future. Even if Randy doesn’t beat cancer, having the mindset that he might helps him get through each day. Optimism and positivity are mental states that can enable a person to take real actions to improve their physical state or condition, and that is how Randy treats his battle with cancer. Randy will be realistic, but he also doesn’t shy away from getting a vasectomy, as it represents his determination to do every possible thing to tell himself he can get through this and he’s still okay. Koltun, Moe. 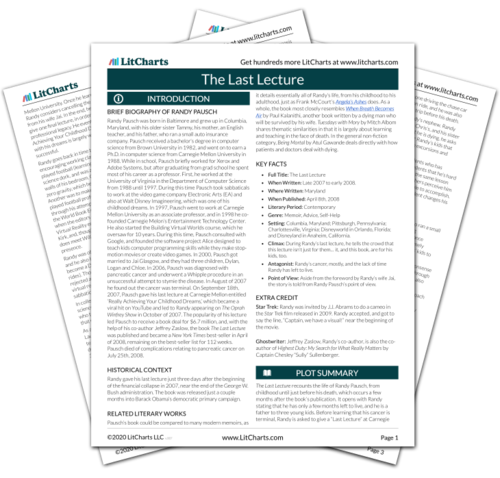 "The Last Lecture Chapter 57: A Way to Understand Optimism." LitCharts. LitCharts LLC, 26 Feb 2017. Web. 22 Apr 2019. Koltun, Moe. "The Last Lecture Chapter 57: A Way to Understand Optimism." LitCharts LLC, February 26, 2017. Retrieved April 22, 2019. https://www.litcharts.com/lit/the-last-lecture/chapter-57-a-way-to-understand-optimism.